Guess who’s been hiding a project from you all! During this past year, I’ve been working behind the scenes with BEHR Paints on a special bedroom makeover for their newly launched site, Designer Stories. Using my guest bedroom, I gave this space a complete overhaul simply by adding paint (…ok and maybe the addition of some new cushions!). Using all my existing furniture, I chose complimentary paint colours that not only brighten up the room but helped to create a fun eye-catching feature wall. Now for those of you following along in my reno journey, a lot has changed in the past year—we had a baby! You may have noticed from my last post that this same room is currently being converted to a nursery now. However, I wasn’t able to show you this set up. So I’m finally excited to share a glimpse of this guest bedroom. For more details and images on this bedroom makeover, be sure to check out my full post on the BEHR website. Also don’t forget to view all of the other awesome Designer Stories for great painting inspiration. Disclosure: I was provided product by BEHR and compensated to write about this project but the thoughts and opinions expressed are my own! Sabrina is the design enthusiast behind the blog, Pink Little Notebook, where she explores her creativity through home décor, thrift store finds, DIY projects and her ever growing love to paint everything in sight! She is indeed a storyteller of style and has an extensive mixture of artistic skills and abilities which include everything from make-up art, graphic designing, painting, drawing, and even self-taught photography, just to name a few. Through her blog Sabrina combines everything she has learned over the years and hopes to inspire others along the way! Yeah, some of these paint-only projects are pretty meh. But this has inspired me like few others have! An outstanding design, execution, use of positive/negative space…SO glad I found your site! Oh my gosh I so love that!! You did an amazing job and it looks beautiful! 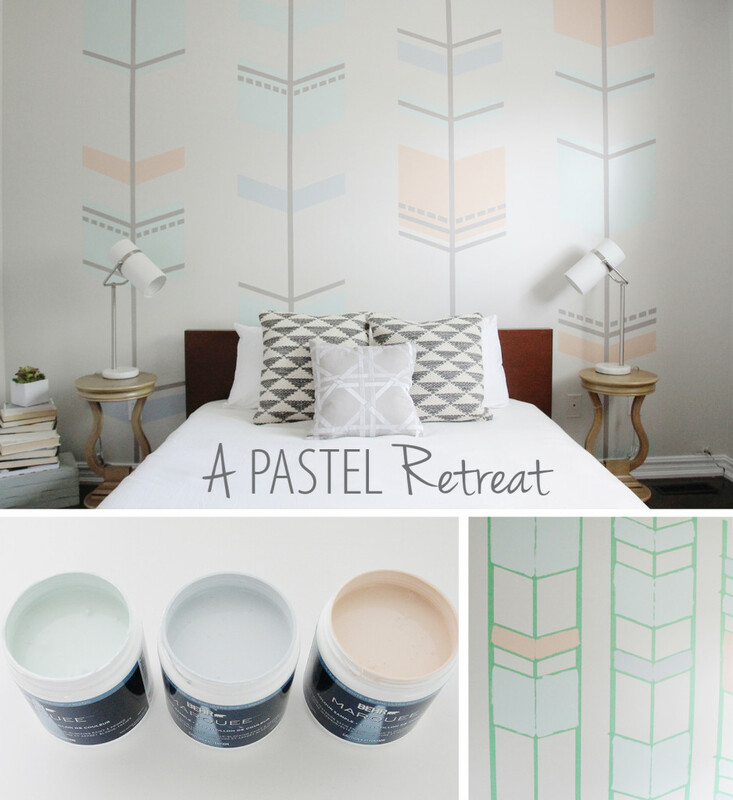 I had no idea pastels looked so wonderful on a wall. This is SO cute! I wish I could paint the walls in my apartment, because I would love to do something like this! Wow! That wall is so awesome! Love the wall design, the colours go so well together! I absolutely love the look and the technique! Great job and a wonderful room! This is stunning! It turned out so well. You’ve inspired me to paint some of my walls! Thinking about the BLANCO SILGRANIT Sink? © 2019 PinkLittleNotebook.com. All rights reserved. PinkLittleNotebook.com participates in select affiliate advertising programs. This means that if you click and/or make a purchase through certain links on this site or any related social media platforms, PinkLittleNotebook.com may make a commission from that click and/or purchase. All opinions are my own, and all brands featured represent what I personally like and support.